This topic has 115 replies, 49 voices, and was last updated 6 years ago by bland. Decent slide that. Good to see the photos. The guy in the red and blue top is clearly having none of it. Ooh. Going that way Monday, thought I might ride up or down it at some point. The sight of avalanche debris sends a shudder down my spine. Good job there’s some many threads on trail conditions or someone might gone MTBing there. Shall i put my arva bleeper in my CB for tomorrows ride? You never can be too carefull you know. You need bleepers just for road riding at the moment. This is what Rivington looks like right now. Gosh, that picture doesn’t show how steep Winnats is either. 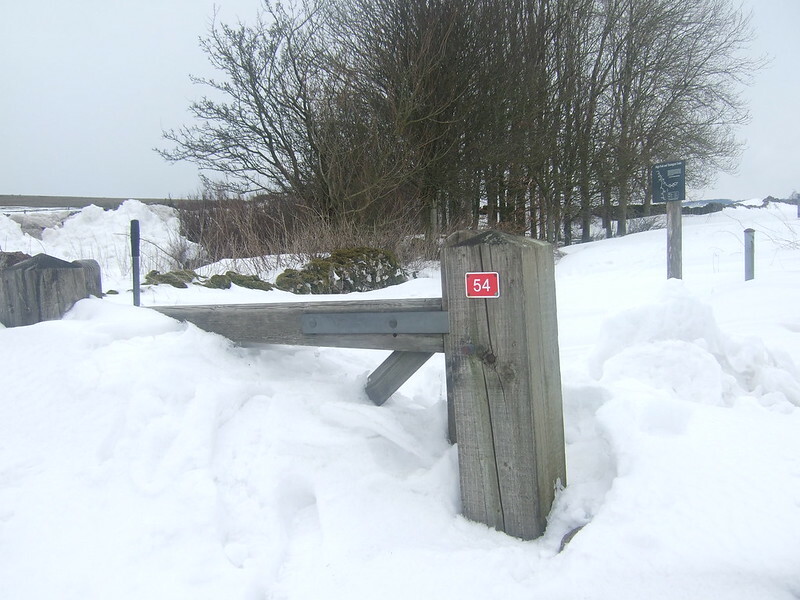 Not too much snow here anymore, however there are still some whooper drifts on the footpaths up against walls. Was lucky enough to see a little owl while mtbing out yesterday, was wondering how the wildlife is coping in these conditions. I turned back about 50m after climbing over the snow at the Rivington end. Wasn’t so much the surface that made me pack it in, but the hundreds of people who’d decided to go for a stroll up the road. Has it been ploughed all the way over the top? I think it has now. The plough arrived shortly after I took that picture I think, probably to try and release the 7 or 8 cars that were trapped up there. On the Belmont side there was no snow at all anyway. There’s still all that snow up from Rivington though, that goes almost all the way up to the junction with Belmont road. Yep, it’s clear – was over there this morning. Did hear that it was closed again for a while this morning – no idea why. It’s all a bit soft so am guessing some of the ploughed piles may have slumped but if I find out more I will post it up. Lots of snow but great fun. No, av a Swisskit. (For those of a certain vintage). I rode up Winnats yesterday. Great that the roads are now clear but what about the cycle paths! And some people never made it out alive! Love the avalanche photos from Winnats Pass. Would you mind if we used them on the BBC News website? Thanks for that – I will give them a shout. They are hotlinked images and the OP has not copied them and we are not hosting copies of these images. I’ve just received an email from the owner of Safariquip that he intends to seek an injunction against us for copyright theft of these images. I have explained that hotlinking is not the same as copying. I have even explained how the appearance of the images above is entirely within his control and he can quite easily make them go away if they are that sensitive. But to no avail – he’s still intending to take, not only legal action against us as publisher of this forum but also to bill us for the use of the images. His first threat came through at 10am on Bank Holiday monday in the form of a veiled legal threat to remove the images ‘by noon’ – yes! he used the word ‘noon’ in a sentence outside of a western. The OP of this thread has done nothing wrong – He’s neither copied or passed off the images as his own. We (Singletrack) have similarly done nothing wrong and we will defend both ours and our users rights to be able to reference publicly available material on the internet without having to worry about silly people threatening us with legal action when we do. Not wanting to start a flame war but I’ve also let them know that there’s a lot of stw posters who are in their target market and that the threats they’ve made are likely to backfire in terms of their reputation and sales. There are some complete morons on the internet and he is obviously one of them…..
And they’re not even that good as photos go, nor unique. Complete buffoon. It’s clear from your Facebook posts that you really haven’t understood what Hotlinking is. It’s absolutely NOT copying of images. The images have not been downloaded from your pages and stored elsewhere, a fact that can simply be demonstrated by you removing the images from your Facebook page, as I advised, and watching all the places on the internet where they are displayed simply disappear and be replaced with an error message or a little blue square. If they had been copied as you seem convinced they have been, then you removing them from your Facebook page would have no effect on their appearance elsewhere. Also, I should point out that the reply that you have posted on your own personal Facebook page is from me. I’m a Director here at Singletrack. That reply was not from one of our team of volunteer moderators. And for the record, had you not shrouded your original email in the misjudged pretence of a legal threat (Who uses the word ‘noon’ anyway?) at 10am on a bank holiday, then you would likely have received a much more sympathetic response that may have included such helpful dialogue as, ‘If it’s simply an issue of credit then why don’t we just add a credit and link to the OP’s post to clear things up?’. While we, as a publisher are very sympathetic to the misuse of anyone’s images and would never deliberately breach anyone’s claim to copyright (we also appreciate that the misuse of hotlinking and copyright is a controversial issue) we are also prepared to stand up against anyone who’s opening gambit to any dialogue consists of veiled legal threats against either us or our registered forum users. And finally, having had hotlinking explained to you several times now and how the control of your own hotlinked images is within your control, why are the images still visible on our forum? And in case there’s any doubt, the above can simply be summed up as – Don’t start throwing veiled legal threats and setting deadlines as an opening volley when you could have simply been polite and asked us to look at it. On a Bank holiday FFS! Should I find myself in the market for “travel accessories” or “adventure gear” I now have a good reason to eliminate one supplier from my list of possibles on the grounds of their being a) greedy muppets and b) mardy sods. Wow, that avalanch must have been quite awesome to watch. We (Singletrack) have similarly done nothing wrong and we will defend both ours and our users rights to be able to reference publicly available material on the internet without having to worry about silly people threatening us with legal action when we do. Really great to hear, this. Good work Mark. Never heard of them but they are definitely on the avoid like the plague list. It’s certainly not always practiced on forums but I think ideally the OP should have credited where he got the photos from in his first post. I don’t see why it should be STW’s responsibility though. Lordy, it’s not as if the original thread wasn’t interesting enough without this! I’d not heard about Safariquip before but I will go out of my way to avoid them now. The topic ‘AVALANCHE! !’ is closed to new replies.